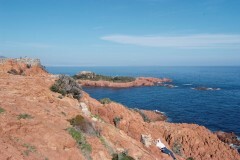 The part of the “Pic du Cap Roux” which lies north of Antheor offers far reaching views on the back-country and coastline when the weather is good. A short hike on the wood track leads to the Rock of St. Barthelemy, which offers a beautiful panorama view but whose ascension requires being surefooted and free from vertigo. The path to the Pic (peak) on the Route des Cretes takes approximately 5 h from there. 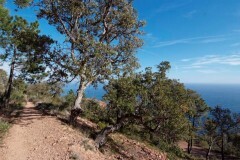 You reach the destination through Frejus, St. Raphael, the coastal route through Agay and Antheor. A few kilometres behind Antheor is a car park on the right, next to the old casemates. The Cap Roux lies on the North of the car park. On the road, approximately 50 m behind, lies a wood path with gate on the other side of the road. This is where the path begins. Directions on Michelin Map 84. For the hike, we recommend the Map Nb. 3544 (Frejus St.Raphael) from the Institut Geographique National.